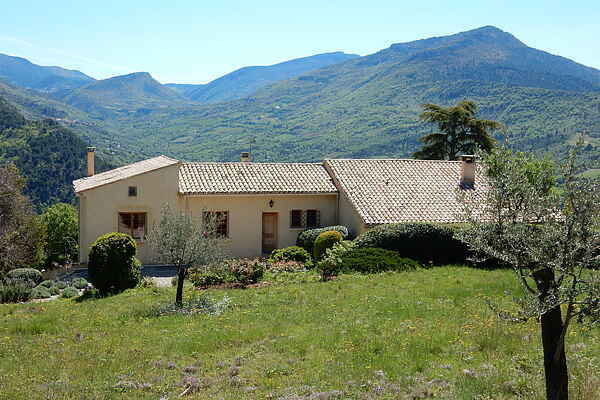 The view over the hills and mountain landscape at Buis-les-Baronnies (4 km) is simply breathtaking. This lovely vacation home offers the nature enthusiast, peace and quiet; all the ingredients needed for a great vacation; hikes through valleys full of fruit trees and aromatic plants. Your fresh water is supplied from the well (on the property). The home has lovely airy rooms that are tastefully decorated, allowing you to really relax. The owners live in a separate part of the building. In the lively village of Buis-Les-Baronnies you will find lots of restaurants, quaint streets and monuments, such as a covered market and a gate dating back to the renaissance in the Rue des Quiastres. The Ouvèze is where you can enjoy a canoeing or kayaking. From your home you can make wonderful hikes over the GR9, a famous hiking route that reaches the top of the Mont Ventoux (summit at 1912 meters). A real thrill here is mountain biking. For culture enthusiasts, a visit to the medieval town of Vaison-la-Romaine (25 km) with its (still intact) two thousand year old bridge, is a must. Nearby Nyon (34 km) offers lots of history and cute terraces and restaurants.